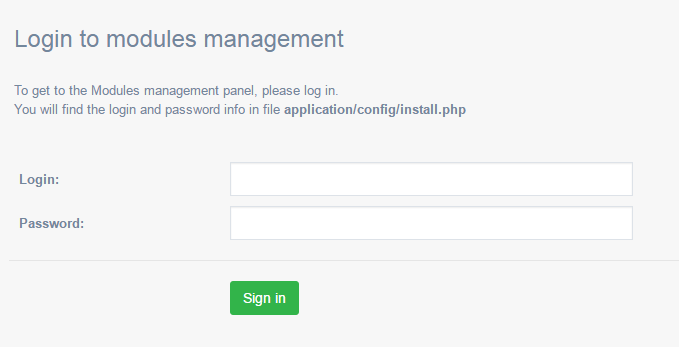 Modules management section (/admin/start/mod_login/) will let you enable and disable add-ons, manage site updates, and more. Access to this section is password protected for security reasons. You can view the module info (version, files list, superior and dependent modules), and you can delete/uninstall the module. Please note that a module can only be deleted if it does not have dependent modules. Once the module is deleted, you can find it in the Enable modules section (/admin/install/enable_modules). It means that you can uninstall a module and install it again without limits, as long as the modules files are stored on your site server. Please note that every new installation deletes user-generated information and demo content is installed instead. Enable updates (/admin/install/updates) is for module updates. In section Enable product updates (/admin/install/product_updates) you will be able to run an updater script to update the script from version to version, e.g. Genie to Honey. Installed libraries (/admin/install/libraries) gives you the list of libraries that are used by the system. Enable libraries (/admin/install/enable_libraries), similarly to Enable modules, lets you activate new libraries. Please note that programming skills will be necessary to handle it properly. 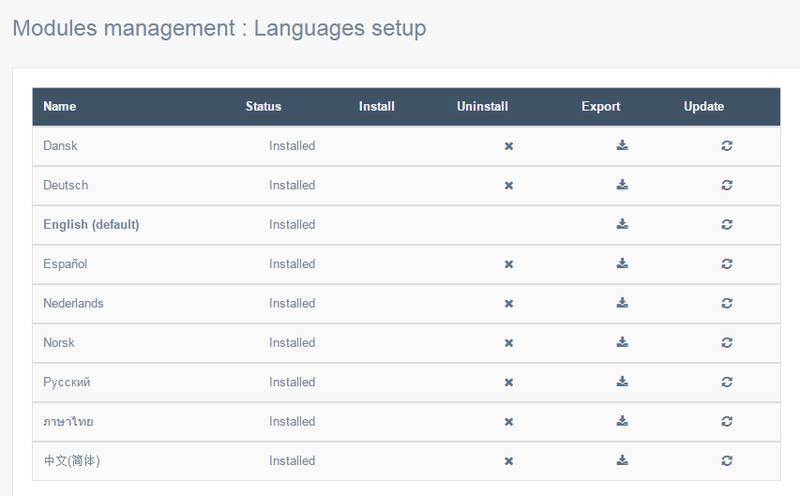 In section Languages (/admin/install/langs) you can install and uninstall site language versions, update and export language files. Update is necessary after you’ve edited the language files, to apply the changes throughout the site. Important note: Every change that you make in the language files from the admin control panel will be stored in the database. When you update a language from here, from the Modules management page, all database entries will be replaced with the content of the lang files. That is why it is important that you create a backup version of all your lang pack changes, and update the lang files with your changes as well if you want to use the Update feature. The Export feature will create a ZIP archive that you will be able to save on your local computer or forward to a translator to do the editing/translations. Read more about languages management here. This section (/admin/install/installer_settings) contains FTP information that you or your support manager have indicated during installation. It also lets you restrict access to your website by IP address(es). It can be useful for the development stage or for when you are not ready to go live for some reason.